I’m always frustrated at how little quality information there is available around Diastasis Recti. Many women aren’t even aware of the condition or others have received incorrect advice or dangerous exercise recommendations, which can end up doing more harm than good. 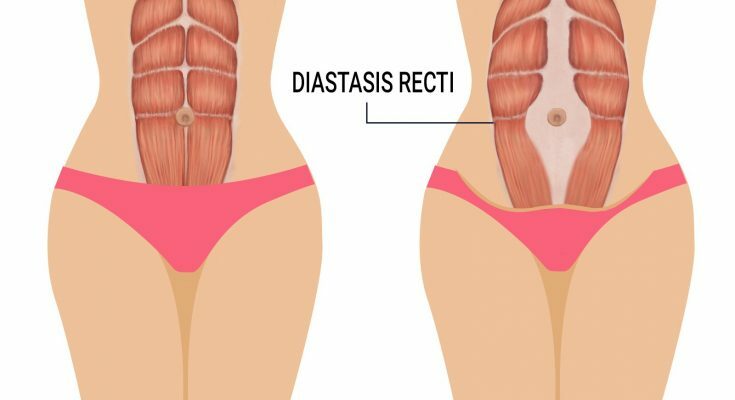 If you’re pregnant or have had a baby then Diastasis Recti should definitely be on your radar. I’ve rounded up the questions I get asked most about the condition. Diastasis Recti (DR) goes by many names. It is also known as Diastasis Rectus Abdominus (DRA) which is how most physiotherapists refer to it. Diastasis means ‘separation’ and during pregnancy we refer to the diastasis of the rectus abdominal muscles. Although it’s actually the connective tissue, the linea alba, which holds the rectus muscles together that widens. How much the linea alba has to stretch to accommodate a pregnancy will generally determine the width and depth of your postnatal separation. When the muscles are separated the core system can’t function optimally and provide stability for the torso and pelvis. The action of the rectus abdominis (your six pack muscle) is trunk flexion (bending over, crunching up) but when standing, it supports the visceral organs, holds the rib cage and pubis together and gives anterior support to the lumbar spine – so it has some very important jobs! Your rectus abdominis is compromised during pregnancy and a weakness in this muscle can affect the entire muscular system. I have some videos on my website, which will help you determine if you have a diastasis and work out the size of your separation. Yes, it does. We now know that assessing the depth and tension of the connective tissue (the linea alba) is far more important than just the old school method of recording a width separation. It’s important that you accurately assess your Diastasis 2-3 weeks post birth to determine the size. Testing too soon after birth can be inaccurate as extra fluid and a contracting uterus can inhibit an accurate test result. Most women will have some degree of separation towards the end of a pregnancy, although you’re not likely to feel it happening. A diastasis is naturally occurring and often needs to happen to make room for a baby. But it’s the size and then depth of the separation that can become problematic post birth if not managed correctly. Yes, you can prevent and reduce diastasis during your pregnancy. Posture management, exercise, good nutrition and avoiding excess weight gain during pregnancy will help to reduce separation. Make sure you’re not increasing the load on your abdominal muscles – avoid movements like frontal planks and press ups, but also be careful with things like how you push your buggy, get out of bed and lift your older children. Helping to prevent too much separation during pregnancy will help healing post birth and reduce some of the issues associated with diastasis recti. Learning how to breath and activate the four core muscles (Diaphragm, Transverse Abdominus, Pelvic Floor and Multifudus) correctly both during and beyond pregnancy will help to reduce separation during pregnancy and then aid healing post birth. If your diastasis has not closed to optimum 8-12 weeks post birth then specific strengthening exercises, posture management and good nutrition are required to help healing. Learning to breathe and activate your core muscles precisely is therefore one of the first steps in the healing process. I go through breathing and correct core muscle activation in great detail in the Birth2FitMum programme. Breastfeeding does have an effect on recovery, some women may find it hard to close their diastasis to optimal whilst they are nursing, especially during the first six months. This is no reason to stop, it just means that you may need to be super vigilant about your posture and rehab exercises to prevent the separation increasing. And don’t worry about the fact that it’s not closing as quickly as you like. Some women seem to be affected more by this than others. I had my baby a long time ago, is it too late? No, it’s not. It’s possible to heal a separation many, many years post birth. I have trained women who are 10+ years postnatal and they have noticed a big difference in their core strength, tummy appearance and posture. So it’s never too late to improve. You can also continue to heal a separation during the first trimester of a pregnancy if not healed optimally before conceiving. Isn’t surgery the only fix in some cases? It annoys me that on many posts I see about DR on social media there are often comments which suggest ‘surgery is the only option’. This is definitely not true and the latest findings certainly do not suggest this and neither does my 20+ years experience. In fact, only 5 percent of women will need surgery to correct their diastasis. If you have been trying to heal your muscle separation for more than 12 months, have finished breastfeeding and your separation is not changing and you also find it hard to create any tension of the linea alba then you should see a women’s health physiotherapist for an ultrasound. An ultrasound will show you in detail if the connective tissue (linea alba) has stretched beyond healing with rehabilitation exercises, posture management and nutrition. When is my gap considered healed? I get asked these questions several times a week; ‘”I still have a 1-2cm gap, will it stay like that forever?” and “When can I get back to advanced core strength exercises?”. A 1cm shallow gap is not a diastasis. A normal linea alba (pre pregnancy) can be 1-1.5cm wide. Recent studies suggest that you do not need to close your gap completely to regain good core muscle function. So you may have what we now refer to as a ‘Functional Diastasis‘. Even though your stomach muscles may not be completely closed or look/feel similar to what they did, pre pregnancy. If you suffer with any of the above issues then your diastasis is probably not functional and more focus on rehabilitation exercises could be required. Otherwise you may be ready to progress on to more advanced core strength exercises, but if in doubt always seek advice. I’ve seen a lot of ads for tummy binders, do these help? Specific pre and postnatal belts and binders are very popular at the moment, with many companies now stocking these ‘fix your tummy’ products. One of the first ever ‘heal your diastasis programs’ was based almost entirely on wearing a binder during the exercise content and throughout the days and weeks whilst on the program. There are varying views on this, some professionals swear by them, but I believe you don’t need them. I do know a specific c-section binder can help healing, but they should always be used in conjunction with a physiotherapist, otherwise you risk the binder doing the work which means your muscles won’t strengthen. If you are looking for a safe and effective postnatal program that will help heal Diastasis Recti then check out theBirth2FitMum programme. Lorraine Scapens is a Pre and Postnatal exercise specialist, she has over 25 years experience. Lorraine’s focus is on diastasis prevention; healing and ensuring mums are pain free and can enjoy living an active life with their kids. Lorraine created her website Pregnancyexercise.co.nz several years ago as she wanted more women to benefit from her knowledge and experience. Now thousands of mums around the world stay in shape during and beyond pregnancy with her online programs. Mum to 3 young girls, Lorraine also knows first hand what it is like to juggle, fitness, family and a business so she ensures that her programs are suitable for busy mums.